Jess and Arie’s wedding suited them perfectly. 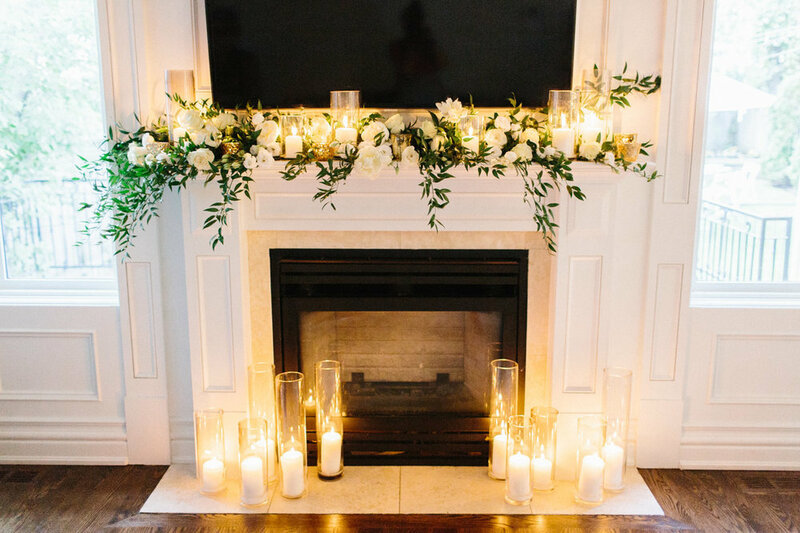 Together they created a celebration that beautifully blended their impeccable style with important family values, and even included their treasured rescue dogs into the day’s celebrations with enviable ease and elegance. Following a sweet first look complete with dogs in hand, we went to The Great Hall in the west end of downtown Toronto to take photographs in the light and airy spaces that both Jess and I fell in love with. 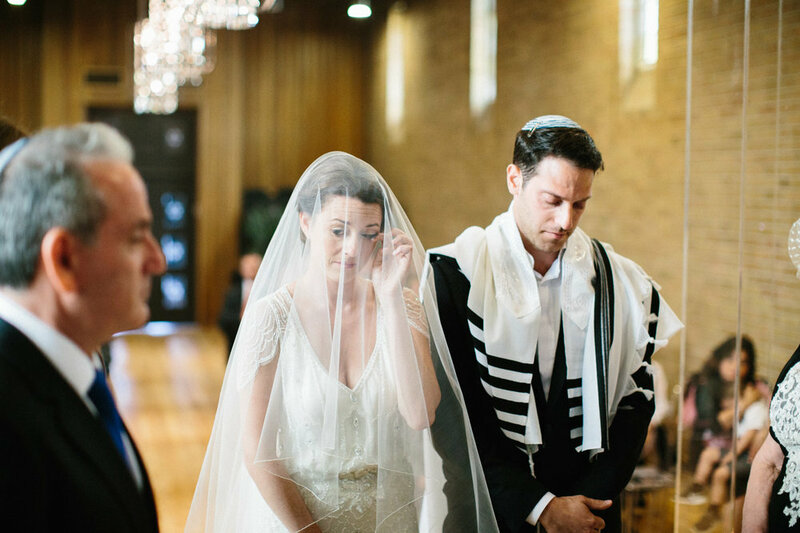 A beautiful and emotional wedding ceremony was held at their neighbourhood family shul down the street, followed by an intimate backyard reception for their closest family and friends. The majority of the day allowed for the dogs who are such a big part of their lives to take part in the festivities, and an at-home reception kept things simple and allowed guests to comfortably move back and forth between the indoor and outdoor food and drink stations as it softly began to rain in the evening. Their beautiful and personal style as a couple shone through in all the little details they thoughtfully added to the day. Jess sported her favourite relaxed moccasins along with a stunning beaded dress harking back to the 1920’s that complimented Arie’s stylish and classic dark navy blazer. The dogs were dressed up in simple green and white floral garlands, which matched the bride’s classic elegant bouquet of white flowers and flowing greenery. 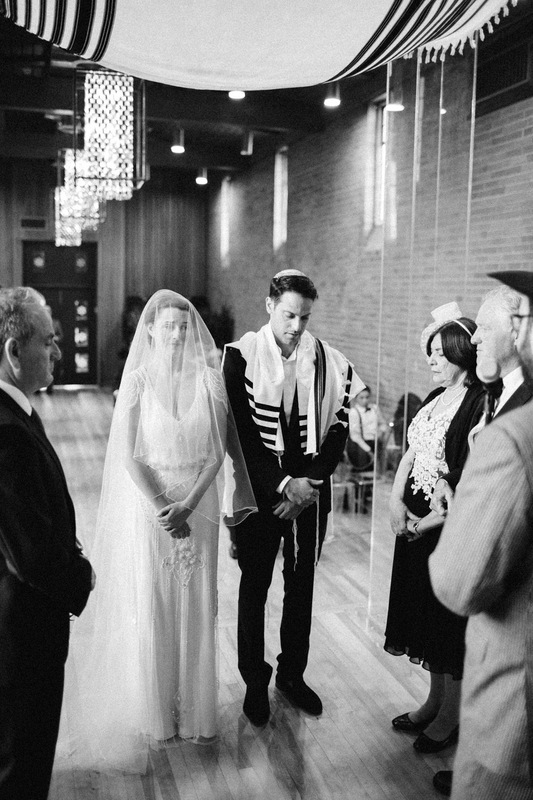 Jess absolutely transformed the interior of their shul by envisioning a beautiful minimalist Plexiglas chuppah, clear modernist chairs, and elegant candle displays that opened up the space while maintaining a cosy family feeling. I’m always a fan of intimate backyard receptions, and theirs was no exception. Edison lights criss-crossed the backyard, lighting and warming up the space outdoor space throughout the evening. Food stations offered a variety of dishes for family to enjoy standing around high tops or settled into the living room, and the cutting of the challah was fittingly held with family gathered close together together in the kitchen. I absolutely loved getting to work with some of my favourite Toronto vendors again for this wedding. It’s always a treat to shoot at The Great Hall, and I’ll never tire of elegant bridal chignons styled by Amy at Bridal Hair Collective! All the other wonderful vendors I was introduced to at this wedding are listed below. I hope you enjoy!